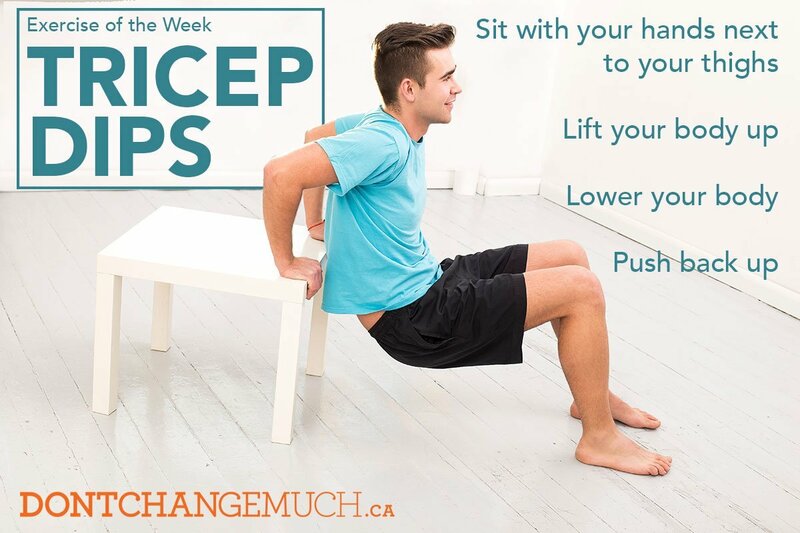 Sit on the edge of a chair or bench with your hands next to your thighs. Lift your body out just in front of the chair, with your feet flat on the floor and your knees bent. Lower yourself down so your elbows bend no more than 90 degrees and push yourself back up. How many reps/sets? First timers try 3 sets of as many reps as you can do. Do these 2-3 times a week in front of the TV on commercial breaks. After about a month work your way up to 3-4 sets of 12-15 reps. Easy to accomplish while watching a 30 minute sitcom on TV.